Preminger’s autobiography reveals that for the 1954 film adaptation he wanted to make “a dramatic film with music rather than a conventional film musical”. Feeling that the stage constrained the opera and Broadway versions, he fleshed out Hammerstein’s story-line with elements drawn from the (1846) novella on which the opera was based. While casting established entertainers in the leading roles, it was still felt necessary to dub the operatic singing! The result was groundbreaking and well received. 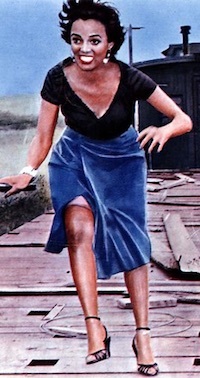 As the title character, Dandridge became the first African American to be nominated for the Best Actress Academy Award. 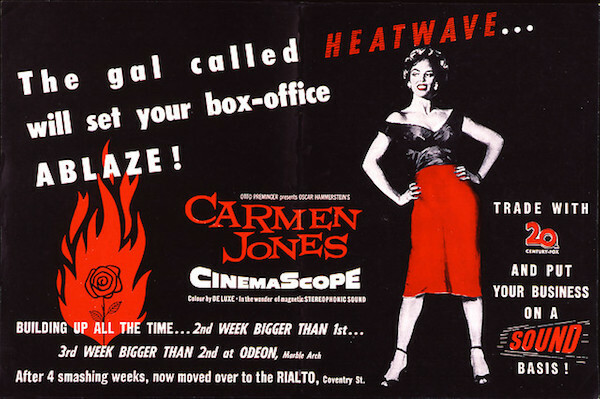 Our presentation of Carmen Jones is part of the BFI’s BLACK STAR season taking place UK-wide, supported by Film Hub London, part of the Film Audience Network, awarding funds from the National Lottery. BLACK STAR is a celebration of the range, versatility and power of black actors on film and TV, taking place in cinemas nationwide, October – December 2016. Here is a link to the Review in the New York Times following the film’s opening night – an interesting document saying as much about social attitudes in the mid 50s as it does about the film.